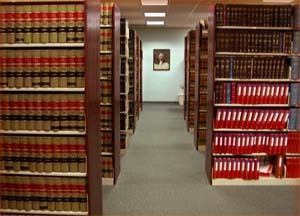 The Justice Center’s Law Library is the home of numerous Texas and U.S. materials intended for the practicing attorney. Included are regional reporters such as the Southwestern Reporter and federal reporters such as Federal Reporter and the Federal Supplement. Digests, law reviews, dictionaries, encyclopedias and form books for various topics are also available. Also included are a large number of historical volumes such as Texas General and Special Laws and Texas Reports dating back to the 1800’s and early 1900’s. The library staff is available to assist and direct patrons to the appropriate resources and reference materials. They, however, may not give legal advice or interpret the law for anyone. They may not tell anyone how to proceed with his or her case. Remember, research must be done by the patron, not the staff.